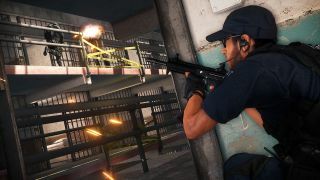 Battlefield Hardline gets a new DLC pack some time next month, so Visceral Games has thrown together the above video to show it off. Dubbed Betrayal, the pack includes four new maps, which the trailer serves to reveal. They come in the form of Alcatraz, Chinatown, Thin Ice and Cemetery. In keeping with the functional nature of shooter map names, Alcatraz is set in Alcatraz, Chinatown is set in Chinatown, Thin Ice has ice in it and Cemetery is set in a cemetery. Seriously though, if you want some better insight into the maps, check out the video above. There will also be seven new weapons and two new vehicles, in addition to a 'Gun Bench Super Feature' which lets you customise weapons and uniforms. Since it's a super feature, it's sure to be worth checking out. Betrayal is releasing in March, but there's no word on a specific date as yet.